As the saying goes, it’s the journey not the destination that matters. Life is not static on Earth nor in the Universe. The growth and evolution of mankind and matter are perpetually in motion. What may be perceived as perfection in any given moment is eclipsed in a wink. As your heart beats, you too may shift and change and what at one time was appealing and drawing you in becomes stale and passe. Maintaining an openness to changing horizons will keep you on your toes and learning in the University of Life. Within the Multiverse, galaxies, constellations, suns and planets are in constant motion. Their infinite structure holds the power and substance of the future, an ever expanding world of creation and expression of the Creator, as do you. You too are undergoing tremendous movement and change. Your world will never be the same again, not on the outside nor on the inside of you. It is your destiny to ascend with Mother Earth within her solar system and for you to take your place within the Cosmos. Coded light forms and highly charged energies from otherworldly sources are being stepped down to you to effect change for the better. The energies from the Orions (pictured here) are assisting your empowerment. The new levels of consciousness reaching your hearts are impregnating you with the desire to build the new world you are dreaming of. So fast is your personal evolution ocurring that it is with hindsight you must look back to see where you came from and see where you have now landed. No matter how things may appear or be presented, your heart knows the truth. Your inner transformation is at hand and you are handling it well, despite the challenges of unforeseen change.The Spiritual Hierarchy is tending to all your creations and manifestations with love and support. We give thanks for your acceleration and devotion to your Ascension process. What you do for yourself, you also do for others. There are magical shifts afoot for the coming to fruition of the Divine Plan for mankind and Mother Earth. 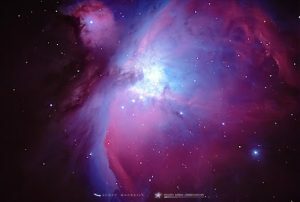 Image: Where stars are born in the Orion Nebula.